San Francisco is scrambling to figure out how the Affordable Care Act will impact the city's own landmark universal health legislation, less than three months before the full rollout of Obamacare. Barbara Garcia, who runs the Department of Public Health, is leading a task force of health experts, business groups and labor leaders who have until the end of November to decipher what health experts are calling confusing and complex details in both the local and national health laws. "How do you make these two laws correspond?" "The question for the task force is how do you make these two laws correspond," said Ken Jacobs, chair of the Labor Center at UC Berkeley who specializes in health policy, and who is also on the task force. "In my view, they correspond quite well, though there's some work to do around the edges." Healthy San Francisco rolled out in 2006 to provide universal health access to the city's 85,000 uninsured. Today, it covers about 60,000 people. Now, health experts and city leaders are floating the idea of using Healthy San Francisco monies to help uninsured residents pay their Covered California premiums. Even with federal subsidies available under Obamacare, the cost of insurance may be out of reach for many, they say. And, experts familiar with Healthy San Francisco say additional financial incentives for consumers will increase the number of young healthy people who sign up for insurance under Covered California, the state's new health insurance marketplace. Businesses fund Healthy San Francisco through an “employer spending requirement,” which was bitterly fought by some groups when the law passed. Any business employing 20 or more workers must pay between $1.55 and $2.33 per hour, per employee, as long as the worker puts in at least eight hours a week. Some businesses can pass off part of that cost. 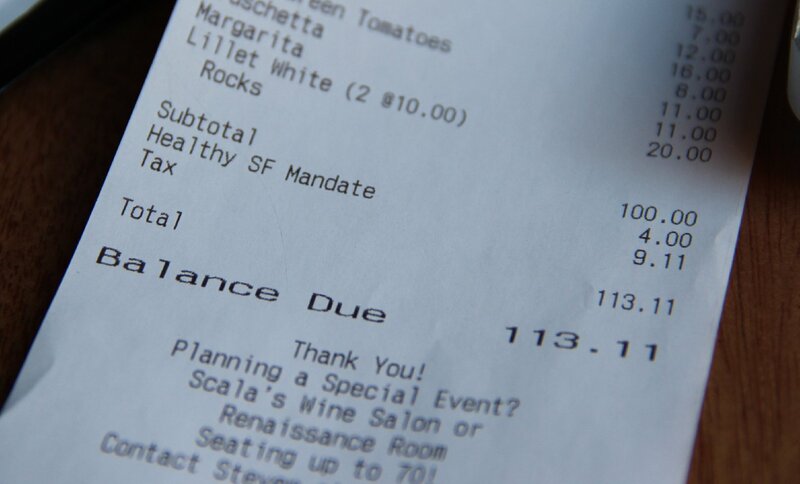 People who eat in San Francisco restaurants, for example, might see this as a line item on their restaurant bill. "There are some who feel the employer spending requirement should go away," said San Francisco Supervisor David Campos. "We believe eliminating the employer spending requirement would be a major disaster." But prominent business groups such as the San Francisco Chamber of Commerce say they're worried that using Healthy San Francisco funds could create a different problem —making workers ineligible for Covered California. "We all want to ensure people get the benefits they're entitled to under the Affordable Care Act," said Jim Lazarus, with the San Francisco Chamber of Commerce "But we're concerned about how the employer spending requirement interacts with the Affordable Care Act." Lazarus said the Chamber and other business groups worry that money employers set aside for workers to spend on their health care costs could count as minimum essential coverage, which they say could fulfill the individual mandate under Obamacare guidelines. City leaders are already on the record as saying Healthy San Francisco will not fulfill the Obamacare individual mandate. But there are more questions than answers at this point around meshing Healthy San Francisco with the Affordable Care Act. "All we've been asking for is the city to give us guidance on what employers can do," Lazarus said. He's especially concerned about the businesses which do not offer health insurance, but want to comply with the ACA. Jacobs, the UC Berkeley health policy analyst, says the national health law allows for states and cities to offer additional subsidy programs – exactly what the task force is considering for Healthy San Francisco. He pointed to similar programs underway in Vermont, Massachusetts and New York that offer financial help for workers who find paying their insurance premium too expensive, even with the federal subsidies. "Healthy San Francisco could go far in filling in the gaps in the Affordable Care Act," Jacobs said. He's especially concerned about low- and middle-income people who can't afford the premium in the face of the high cost of living in San Francisco. Additional premium subsidies from Healthy San Francisco "could help lower their cost and increase the uptake for Covered California insurance required under ACA." Campos has argued since the task force started meeting in July that "what we're doing in San Francisco is complementary to the Affordable Care Act." Yet another key issue is what to do in place of health reimbursement accounts, which are no longer allowed under federal guidelines. The task force plans to evaluate Healthy San Francisco funding over the next two months. The next meeting is Thursday, Oct. 24. The City says it should have guidance for San Francisco businesses by the end of November.